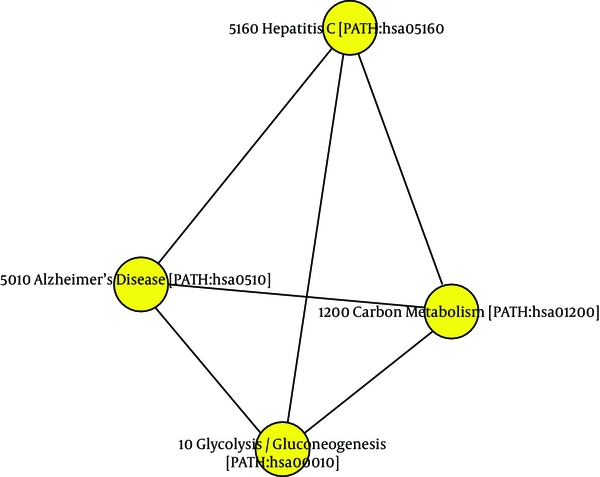 To Cite: Zheng J, Chen H, Pan Y, Yue X. Pathway Crosstalk Network Analysis Provides Insight Into Novel Pathways in Breast Cancer, Iran Red Crescent Med J. 2017 ; 19(10):e12901. doi: 10.5812/ircmj.12901. Background: Breast cancer (BC) is one of the leading causes of cancer-related mortality among females worldwide. There is no effective treatment for it, since the molecular mechanism underlying BC still remains unclear. Objectives: The current study aimed at identifying the hub pathways for BC based on pathway crosstalk networks (PCNs), and revealing the molecular mechanisms underlying BC. Methods: The current case-control bioinformatics analysis used the already published microarray data of BC. The current foundation-application study was performed in Moffitt cancer center, USA, in 2010. To begin with, the gene expression profile of BC (access number E-GEOD-10780), which included 185 samples (143 normal controls and 42 BC samples), was recruited from ArrayExpress database. Then, data pretreatment method was used. Next, the original pathways (OPs), original protein-protein interaction (PPI) network (OPPIN), and attract OPs (AOPs) were obtained. Then, the construction of background PCN (BPCN) and cancer PCN (CPCN) was performed, following by the degree analysis of pathways in the BPCN and CPCN to further identify hub pathways. Moreover, the cross-talks for hub pathways were extracted and termed as hub cross-talks. Results: There were 300 nodes and 42,293 edges in BPCN, and 283 nodes and 25,750 edges in CPCN. According to the degree results, it was found that the degree distribution of pathways for BPCN was concentrated, while that of CPCN was dispersed. Moreover, the degree of original pathways in BPCN was greater than that of the majority of AOPs in CPCN. Based on the threshold of RankProd < 0.01 and false discovery rate of AOP < 0.01, thirteen significant pathways were detected. Using the threshold of impact factor > 240, a total of 4 hub pathways including glycolysis/gluconeogenesis, Alzheimer disease, carbon metabolism, and hepatitis C virus (HCV) infection were identified. Conclusions: Hub pathways such as glycolysis/gluconeogenesis and Alzheimer disease might be the potential signatures for BC therapy. Breast cancer (BC) is one of the leading causes of cancer-related mortality among females worldwide (1). Remarkably, aggressive phenotypes of BC have a poor prognosis (2). Currently, the standard diagnostic methods such as mammography as well as ultrasound are successfully used to detect early-stage BC (3). However, the limited sensitivity, incurred costs, and the expertise required for these tools restricted their application. Therefore, there is still an urgent need to seek for new and accurate screening and minimally invasive approaches for BC. Recently, pathways exerting crucial functions in oncogenesis provided new opportunities for early diagnosis of cancer (4). Given the sophisticated nature of biological systems, pathways need to play roles in a coordinated manner to produce appropriate physiological responses to internal and external stimuli. Previous studies mainly focused on the single dysregulated pathways, but the cross-talks among pathways were frequently ignored (5, 6). In addition, Donato et al. (7) demonstrated that in some cases pathways with significant P values are not biologically significant, while some biologically significant pathways with nonsignificant P-values become statistically significant when the crosstalk effects of other pathways are removed. Moreover, a former study indicated that detecting pathway cross-talks is beneficial to reveal pathway functions (8). Thus, it is very important to understand the cross-talks among pathways to further understand the function of biological systems. Collectively, protein-protein interactions (PPIs) form a global interaction network that can elucidate the overall interaction and functional organization among functionalities. Moreover, a network-based method was utilized to analyze these interactions and explore the molecular mechanism by which biological systems work (9, 10). Hence, based on the hypothesis that 2 pathways possibly interacted with each other (cross-talks) if, by chance, more protein interactions were identified between the 2 pathways than expected, the current study aimed at extracting the pathway cross-talks via systematically integrating information of pathways and PPI network data. Therefore, the current study identified hub pathways and hub cross-talks in BC to explore the mechanisms of BC development based on the combination of biological pathways and PPI network data. First, the original pathways (OPs), original PPI network (OPPIN), and attract OPs (AOPs) were obtained. Then, the background pathway crosstalk network (BPCN) and cancer pathway crosstalk network (CPCN) were constructed, following by the degree analysis for the pathways in BPCN and CPCN. Subsequently, RankProd and impact factor (IF) analyses were conducted to select the hub pathways. Moreover, the cross-talks for hub pathways were extracted and named hub cross-talks. It is believed that our results are helpful to understand the BC progression. The current case-control bioinformatics analysis used the already published microarray data on BC. The current foundation-application study was performed in Moffitt cancer center (Tampa), USA, in 2010. To the authors` best knowledge, ArrayExpress is a larger fully public, international, innovative, and interdisciplinary repository for high-throughput molecular abundance data, primarily gene expression data funded by 22 member states and 2 associate member states. This database can help scientists to realize the potential of big data in biology. So far, there are a total of 2,194,040 assays in the ArrayExpress database. In the current study conducted in 2016, under the filter conditions of “transcription profiling by array”, “Homo sapiens”, and “breast cancer”, the samples were not small, gene expression data of BC under the access number E-GEOD-10780 (11) were downloaded from the ArrayExpress database on the basis of the platform A-AFFY-44-Affymetrix GeneChip Human Genome U133 Plus 2.0 [HG-U133_Plus_2]. A total of 42 BC and 143 normal breast tissue samples were collected from 90 patients with BC in this microarray profile. According to the histopathologic review by a breast pathologist, all of the 143 normal breast tissue samples were free from atypical ductal hyperplasia or invasive BC. Moreover, all of the 42 BC tissue samples were confirmed by the histopathologic review by the same breast pathologist, using the modified Bloom and Richardson grading scheme (12). Thus, all of the 185 samples (143 normal controls and 42 BC samples) were used in the current microarray analysis. The specific information about demographical variables and confounding factors are shown in the paper published by Chen et al. (12). In this formula, M stood for each array empirical distribution and X represented the mean sample quantiles empirical distribution. In the equation, at was on the basis of a probe effect and br denoted the log2 expression value. After removing the repeated probes, aligning the probes to the human genome to obtain the gene symbols, and eliminating the duplicated gene symbols, a total of 20,102 genes were obtained. Kyoto encyclopedia of genes and genomes (KEGG) is a database that offers a reference knowledge base to understand cellular processes. In the current analysis, a total of 300 original pathways covering 6,919 human genes were collected, pathways from KEGG database called OPs. All the human protein interactions (n = 1,048,576) were downloaded from the public source of STRING. After mapping the protein ID to the gene symbol and eliminating repetitive interactions, the study ended up with 787,896 interactions (involved in 16,730 genes). These 787,896 protein interactions were called OPPIN. In an attempt to seek for the pathway cross-talks, the crosstalk analysis was performed for all the OPs. First, the background distribution of protein interaction of any 2 Ops was evaluated. Specifically, each OP was randomized and all genes in a given OP were examined. If a gene did not have any interactions with other nodes, it was removed. If a gene had interactions with other genes, firstly the number of genes it interacted with was recorded, and then, a gene was randomly drown from the protein interaction dataset, which interacted with similar or the same number of genes, and this newly selected gene substituted the original pathway gene. Second, after randomizing both OPs, the number of protein interactions between any of the 2 pathways was calculated. For each OP, the common genes of the 2 OPs were eliminated and all the protein interactions between the 2 pathways were computed. This step of randomization was repeated 10 000 rounds. The number of total interactions of the pairs of corresponding randomized pathways was obtained after 10,000 times of randomizations, and it was defined as the weight value. Then, BPCN was constructed based on these OPs and weight values using Cytoscape (16). As documented, pathways with too few genes could not have enough biological content (17). In light of this, the 20,102 genes obtained above were mapped to the OPs, and the OPs with less than 5 genes were abandoned to select more confident pathways. Subsequently, the remaining 283 pathways were generated and named as AOPs. Then, genes enriched in the AOPs were examined through GSEA-ANOVA to further obtain the F statistic value. Large F-statistic value demonstrated a strong association, but on the other hand, small F-statistic value exhibited that the genes revealed minimal group-specific expression changes. To testify this relationship, t test was used to amend log2-transformed F-statistics values. Afterwards, false discovery rate (FDR) was employed to correct the P values using the Benjamini-Hochberg method (18). Then, these AOPs were sorted in the descending order of FDR. After attract analysis, CPCN was constructed based on the 283 AOPs. First, the weight values were calculated for pathway cross-talks. It was assumed that G1 and G2 were the number of genes enriched in any 2 AOPs. Then, the interaction analysis was performed on the genes in these AOPs. If the genes in one AOP did not interact with the genes in the other AOP, weight was determined as 0. Otherwise, the weight values were calculated on the basis of the formula. Thus, the weights were defined as the sum of absolute value of difference of spearman correlation coefficient between 2 AOPs divided by (G1x G2). This randomization step was duplicated 10,000 times. To select more confidant cross-talks, the significance of interactions between 2 AOPs were evaluated according to the following 4 numbers: “m” represented the number of interactions between AOPs, “M” as the number of overall interactions of all AOP pairs, “a” as the mean value of interactions between the pair of corresponding randomized pathways after 10,000 times of randomizations, and “A” stood for the average of overall interactions of all randomized pathway pairs after 10,000 times of randomizations. The null hypothesis was that the ratio of actual interactions between 2 AOPs to all interactions (m/M) was the same as the ratio of random interactions to all random interactions (a/A). The current study focused only on the AOP pairs where m/M was remarkably greater than a/A. The weight values obtained above were computed and named WICD. Then, the WICDs were corrected using FDR. The pathway cross-talks with FDR values < 0.05 were selected to construct the CPCN. Topological centrality is helpful to extract essential molecules in complex networks (19). Among the topological centralities, degree is an obvious index, which means the number of links of one node with its neighboring nodes (20). In the current study, degree analysis was implemented to deeply explore the significance of cross-talks in BPCN and CPCN. The rank of FDR of AOPs was obtained in section 2.4 in the current study. The AOPs with FDR < 0.01 were selected for further analyses. To detect important cross-talks in BC, RankProd (21) was utilized, which is a simple, yet powerful meta-analysis tool to identify differentially expressed genes between 2 experimental conditions in many studies (22, 23). The pathways with RankProd value < 0.01 were considered as the significant pathways. Based on the formula, the significant pathways with IFs greater than 240 were considered as hub pathways. The cross-talks among hub pathways were regarded as hub cross-talks. 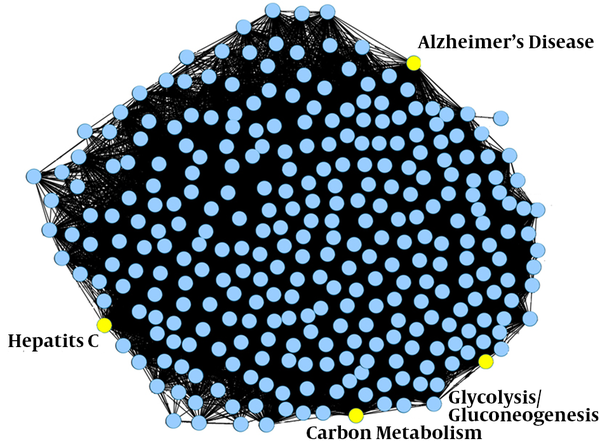 As shown in Figure 1, the BPCN included 300 nodes and 42 293 edges, covering 6919 genes. The construction of CPCN was carried out based on the AOPs. Thus, the study firstly identified 283 AOPs using the attract method. Based on these AOPs, cross-talks were extracted. Nevertheless, the edges where both pathways remarkably overlapped, and the gene members stood for analogical biology were eliminated. Ultimately, a total of 25,750 cross-talks involved in 283 nodes were obtained (Figure 2). Nodes were the original pathways, edges stood for the cross-talks among pathways; yellow nodes denoted hub pathways. There were 25,750 cross-talks involved in 283 nodes. Nodes were the attract original pathways (AOPs); edges stood for the cross-talks among them; yellow nodes were the hub pathways. Next, the degree distribution of the pathways in BPCN and CPCN were checked to explore the significant cross-talks between BC and control samples. According to the results, it was found that the degree distribution of pathways for BPCN was concentrated (Figure 3A), while that of CPCN was dispersed (Figure 3B). Moreover, the degree of original pathways in BPCN was greater than that of the majority of AOPs in CPCN. The degree distribution of pathways for BPCN was concentrated, while that of CPCN was dispersed. Moreover, the degree of original pathways in BPCN was greater than that of the majority of AOPs in CPCN. Based on the threshold of RankProd < 0.01 and FDR of AOP < 0.01, thirteen significant pathways were detected (Table 1). When the IF was set as 240, a total of 4 pathways were identified and termed as hub pathways, including glycolysis/gluconeogenesis (IF = 255.096), Alzheimer disease (IF= 254.187), carbon metabolism (IF = 249.144), and hepatitis C virus (HCV) infection (IF = 244.214). Subsequently, the hub cross-talks among hub pathways were drawn and displayed in Figure 4. Abbreviations: AOP, The rest original pathways when abandoning the original pathways with less than 5 genes; BPCN, background pathway crosstalk network; CPCN, cancer pathway crosstalk network; RP, RankProd; FDR, false discovery rate. Nodes denoted hub pathways. Edges represented hub cross-talks among hub pathways. The edge thickness was the correlated strength between 2 hub pathways. Currently, high-throughput technologies, such as gene microarray, are effective and standard means in biomedicine. Accordingly, a series of computational approaches are successfully employed to discover causal disease-associated genes (25, 26). However, to date, an unsolved problem is how to explain these genes in the biological contexts. A common solution is to utilize statistical method to detect pathways connected with the disease-associated genes (27). Exhilaratingly, the identification of possible pathogenic pathways improves the accuracy when these pathways are utilized as biomarkers, compared with the gene-based methods. Unfortunately, the majority of these methods do not consider the functional dependency among pathways, which may not be capable of generating a comprehensive view to the impact of the disease genes on pathways. Generally, pathways can influence each other via a phenomenon known as crosstalk, rather than acting independently (7). Thus, a novel method was introduced to detect dysregulated pathways in BC. Unlike the existing methods, the current study method considered the pathway interactions among pathways. Comprehensively, the current study discovered that glycolysis/gluconeogenesis, Alzheimer disease, carbon metabolism, and HCV infection were the hub pathways. These promising results suggested that the hub pathways indeed had cross-talks with each other, which further indicated the effectiveness of the proposed method. Alterations in energy metabolism of the cell are regarded as the hallmark of cancer (28). As already reported, cancer cells vitally need glucose similar to the metabolites for cancer cell growth (29). In cancer cells, glucose is metabolized by aerobic glycolysis preferentially, and this phenomenon, known as the Warburg effect, is characterized by enhanced glycolysis generation (30). Dong et al. (31) also demonstrated that silencing of gluconeogenic enzyme, fructose-1,6-biphosphatase, can activate fermentative glycolysis. Except being a striking characterization of cancer cell metabolism, the Warburg effect provides conditions favoring rapid proliferation and apoptosis resistance to cancer cells (32). It is noteworthy that the Warburg effect, as a specific metabolic pathway, might be a promising strategy to inhibit tumor growth and relapse (33). More significantly, a former study implicated that targeting the Warburg effect is a potentially novel therapeutic method in BC (30). Evidence demonstrated that the accumulation of glucose caused by the constitutive activation of glycolysis leads to the HIF activation (34). Consequently, the HIF activation increases the expression of many proteins that favor cancer progression, including apoptosis resistance, metastasis, invasion, and angiogenesis (35). Another study reported that suppression of glycolysis was a potentially efficient approach to inhibit BC stem cell proliferation (36). BC stem cells are responsible for regulating metastasis (37). In addition, a previous study suggested that regulation of glycolysis and gluconeogenesis provides an insight into the therapeutic potential in hepatocarcinogenesis (38). Thus, hub pathway of glycolysis/gluconeogenesis might be beneficial to develop potential anticancer strategies, as many studies demonstrate the enhanced glycolytic metabolism of cancer cells exerts crucial functions in tumor progression. Another hub pathway, Alzheimer disease, was identified in the current study. A link between neurodegeneration and cancer is plausible since these 2 diseases share several genes as well as biological pathways, such as inappropriate activation and misregulation of cell cycle (39). Proteins including Pin1, which has a dual role in protein folding and cell cycle control, play an important part in the physiology of Alzheimer disease and cancer (40). In addition, Driver et al. 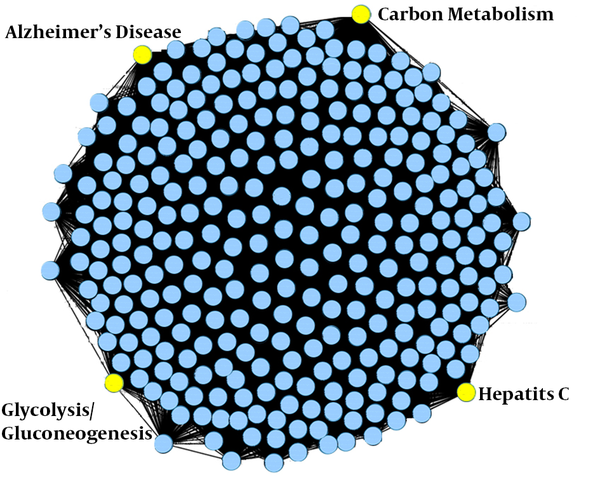 indicated an inverse relationship between Alzheimer disease and cancer (41). A former study also suggested that prevalent cancer had a 43% lower risk of ever being admitted in a hospital with Alzheimer disease, and those with prevalent Alzheimer disease had a 69% lower risk of ever developing cancer (42). In the light of these, the current study results supported the possibility of the relationship between Alzheimer disease and BC. The current study conducted analysis on BC based on PCNs via systematically integrating pathways information as well as PPI network data, for the first time. It was the main strong point of the current study. Overall, the current study successfully identified 4 hub pathways using this novel computational method. However, it should be considered that the current study had several limitations. The samples were downloaded from the open access database. The microarray analysis was not performed on patients with BC. The current study analysis only employed bioinformatics methods to screen hub pathways to explore the pathogenic process of BC, yet the association between pathways and BC was not confirmed by animal experiments. It was the main weak point. Hence, the further understanding of the basic relationship between these pathways and BC is needed to illuminate the molecular mechanisms underlying BC. Despite these drawbacks, it is believed that the predicted pathways offer investigators valuable resources for better understanding of the BC mechanisms and also detecting potential biomarkers for early diagnose and therapy of BC. Additionally, this method might provide analysis on other corresponding studies. In a nutshell, hub pathways such as glycolysis/gluconeogenesis, and Alzheimer disease might be potential signatures for BC therapy. These pathways might provide additional diagnostic and therapeutic targets for BC. The current research received no specific grants from any funding agency in public, commercial, or not-for-profit sectors. Conflicts of Interest: The authors declared no conflict of interest. Funding/Support: No funding/financial support was provided to the study.